Starting at 2pm at the BBC, Portland Place, W1A 1AA with march and rally in Trafalgar Square for 5pm. Bring flags, placards, and lots of noise !! Let us know if you are coming and can help carry flags and banners and give out flyers. See this link for full details of the main national demonstration Together Against Trump and details of all the other protests around the country. 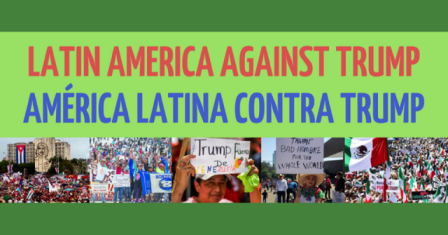 When Trump turns up in Britain in July we must ensure that he gets a clear message that the people of Britain and Latin America reject his view of the world and his imperialist ambitions against the countries of Cuba and Latin America. Maintaining active solidarity with the peoples of Cuba, Venezuela and Nicaragua remains as vital as ever. In all cases we must support the sovereignty of the people and defend their rights to organise their societies as they choose free from external threat and interventions. Read CSC National Secretary Bernard Regan’s article in the Morning Star on why solidarity with the people of Cuba, Venezuela and Nicaragua is as vital as ever. at Hamilton House, Mabledon Place, London WC1H 9BD.